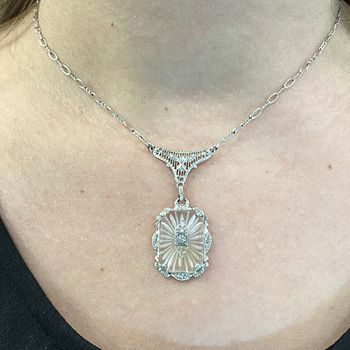 A beautiful Edwardian silver filigree necklace that features 1 carved rock quartz pendant, est. 6.15ct (approx. 17.9 x 12.8mm - 1inch x 5/8inch) and 1 single cut diamond, est. 0.03ct (VS clarity: H colour). It is approx. 16 inches (40.64cm) in length. Click the arrows on the below picture from instagram to flip to the picture of this necklace.